• Real life nut and bolt rebuild carried out by the author. • Over 900 full colour photographs. • Covers all aspects of a full restoration. • Advice on restoration, renovation or repair. • Addresses issues not found in a traditional workshop manual. • How to assess wear in all mechanical components. • Special tools, their purchase, use and possible alternatives. • Advice on what is best left to the professionals. 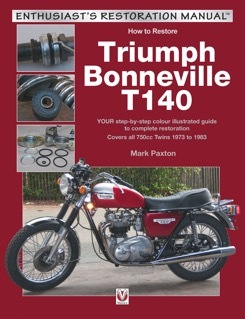 • No Triumph 750 owner should be without this book. The Triumph 750 is probably the classic British motorcycle that most people will recognise, whether they are an enthusiast or not. Their desirability continues to grow, aided by their easy availability and excellent parts back up. This book is aimed at the DIY enthusiast interested in their renovation and restoration, and is fully illustrated with high quality colour images, coupled with clear and concise text. Following the real life resurrection of a T140E, with all the work being carried out by the author, the book shows how to assess wear in all mechanical components, then assists in deciding the most cost effective method of dealing with it. The process is dealt with in detail giving the owner the confidence to carry out their own repairs to a high standard, which will be both cost effective and satisfying. Brakes, suspension, brightwork and trim are all also addressed, making this an essential purchase for all Triumph 750 owners.